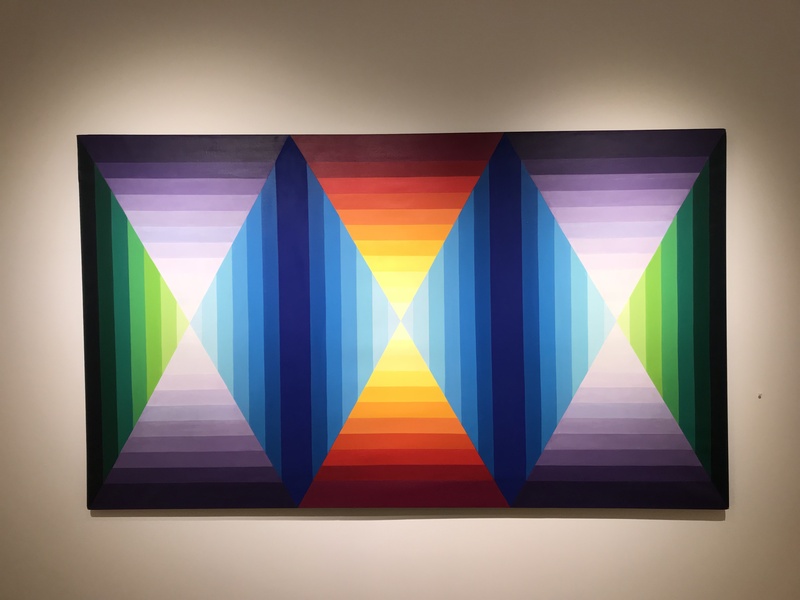 The Carter Burden Gallery is presenting the exhibition “A Shared Interest” that shows work with an emphasis on color and surface. Lilyan R. Stern’s “Variation on Theme #1” from 1970 features three vertical rectangles. Each rectangle has been divided into a series of concentric bands of color. The center form has two lines of symmetry both horizontal and vertical, but the two outer rectangles only have a horizontal axis of symmetry. Stern’s use of bright color makes the obtuse and acute isosceles triangles seem to vibrate off the canvas. One of the fun things about NYC in the late Spring and Summer is the thematic group shows at many of the galleries. If the unifying theme is of the more conceptual variety, it is often an opportunity to find Mathematical art. 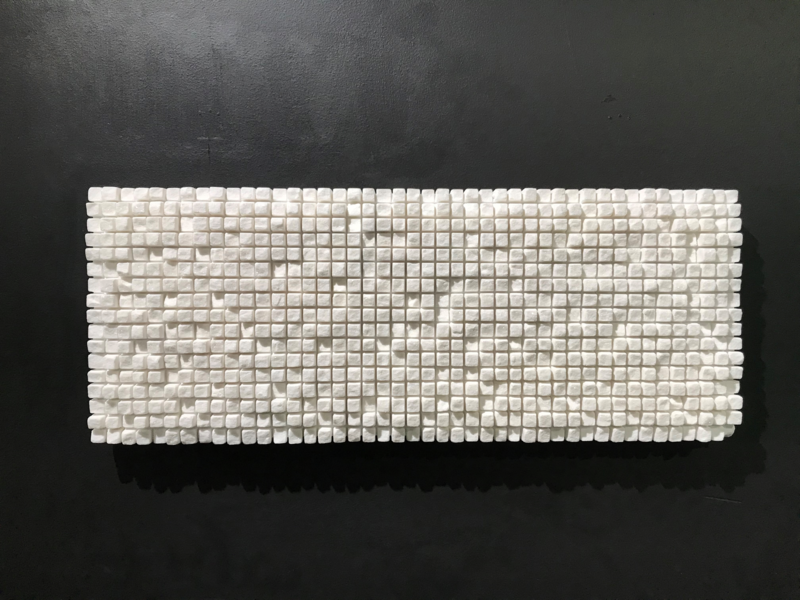 At the Jankossen Contemporary Gallery the exhibition, titled “Monochrome” has Dieter Kränzlein’s white marble wall relief on display. Viewed from the front it is all about the precision of the square grid. 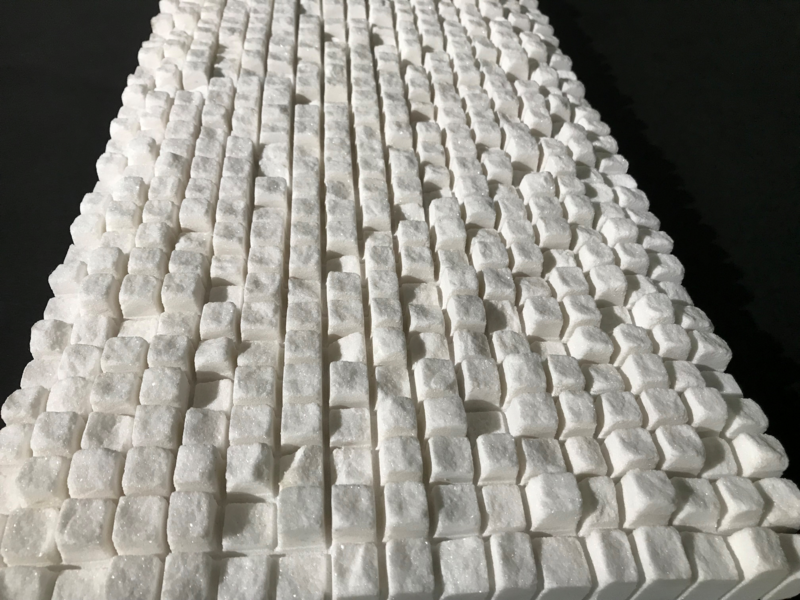 But from the side you can see the rough surface of one face of each of the marble cubes. More groups shows in a few days. Storm King Arts Center is a world-renowned sculpture park located about a hour North of Manhattan near the Hudson River. The permanent collection of the park features a number of works with Mathematical themes. 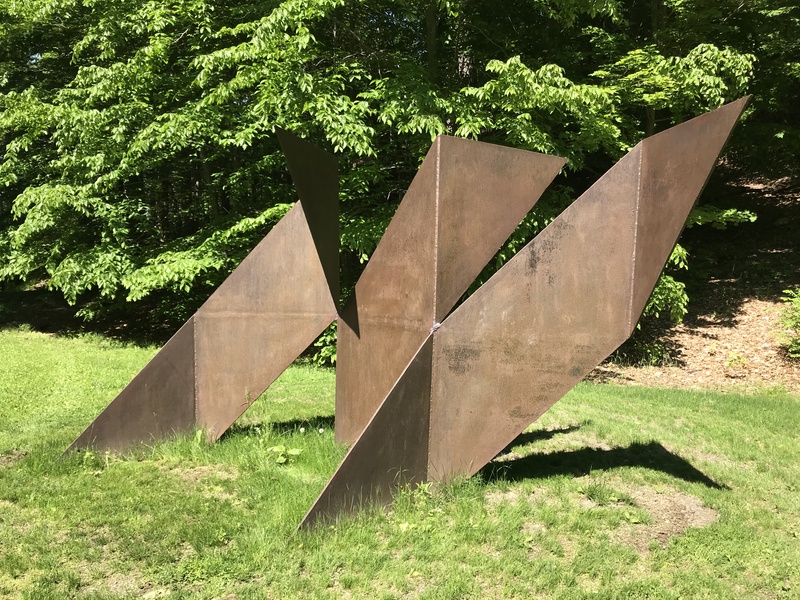 Charles Ginnever’s steel sculpture “Prospect Mountain Project ( For David Smith)” from 1979 is an excellent example. The work is comprised of a giant parallelogram that has been sliced diagonally into three parallel strips that are also parallelograms. Each strip has been folded twice at vertical creases. They are connected at two points along the lines of the folds. The two side sections have the steel bending forward and the center parallelogram has the folds towards the back. 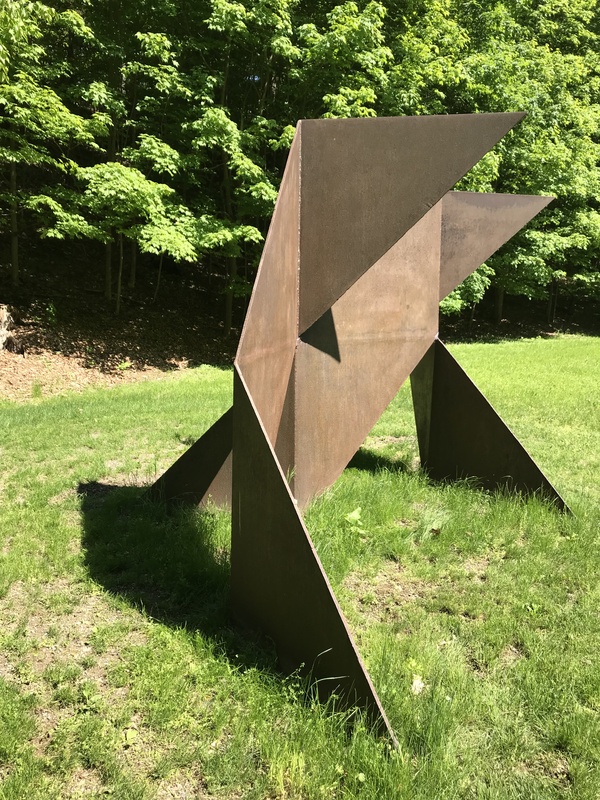 This not only gives the flat plane of the metal sheet a 3-dimensional presence, but it also allows the sculpture to stand securely directly on the ground. The weathered organic texture of the steel contrasts with the hard edges of the geometry. The sculpture complements the natural surroundings of the park.